The Common Core State Standards for Kindergarten through Grade 6 can be viewed from within Montessori Compass. The database is easily searchable and simply clicking on a standard displays all of the measurable learning objectives (elements) that have been mapped to the standard. In the example to the right, a Kindergarten Language Standard for Vocabulary Acquisition & Use is displayed. There are over 30 elements in the Scope and Sequence that map to this standard. Any time one of the mapped 30 elements is documented for a student, the corresponding standard is documented as well. 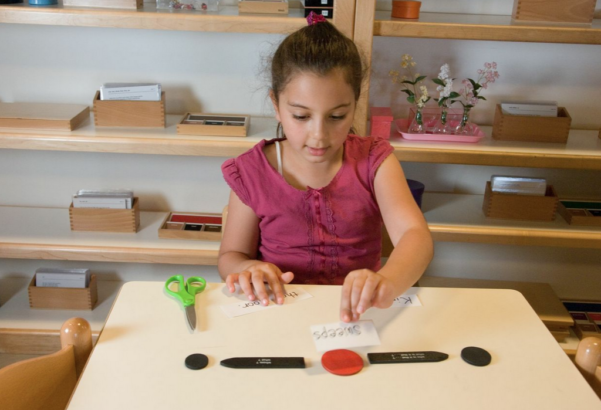 The Montessori Scope and Sequence outlines specific measurable learning objectives for individual lessons. These measurable learning objectives facilitated a highly precise mapping with the Common Core Standards. While every single standard is met in a comprehensive manner by the Montessori Scope and Sequence, the same is not true in the reverse; that is, many of the defined learning objectives in the Montessori Scope and Sequence are not reflected in the CC Standards. 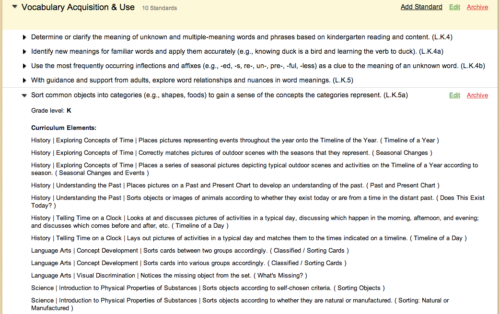 Within Montessori Compass, it is possible to click on an element and see mapped standards (if any are present).